Labhair Foireann PEIG.ie le hEoin ar na mallaibh faoin obair a bhíonn idir lámha aige mar Theicneolaí Oideachais le UCD. Oideachas Tríú Leibhéal: UCD. Bím ag obair leis an teicneolaíocht go mór mór i mo ról mar Theicneolaí Oideachais. Pobal na Gaeilge a spreag i dtreo na teanga mé. Braithim gur cuid mé de dhlúthphobal cairdiúil oscailte fáiltiúil agus mé ag labhairt na Gaeilge agus tugann sé sin an-mhisneach dom. Is breá liom bheith ag obair leis an nGaeilge san ollscoil, áit a mbuailim le mic léinn as Éirinn agus mic léinn as áiteacha eile a chuireann spéis i dteangacha agus i gcultúr na hÉireann. D'fhreastail mé ar Scoil Náisiúnta Dharú agus Coláiste Thulach Mhór, scoileanna nach Gaelscoileanna iad, sular imigh mé le Gaeilge agus Gearmáinis in UCD. Ba sa mheánscoil ba mhó a spreagadh mé chun dul i mbun teangacha agus rinne mé staidéar ar an nGaeilge, an Fhraincis agus an Ghearmáinis ann taobh leis an ealaín agus an eolaíocht. Fuair mé an-oideachas i gColáiste Thulach Mhór i mo chuid ábhar go léir. Ba as Gaeltacht Chonamara do mo mhúinteoir i gColáiste Thulach Mhór agus d'fhág sé sin a rian ar mo chuid Gaeilge labhartha. Is breá liom an chruthaitheacht a bhaineann le teacht ar réitigh (theicniúla nó eile) ar dheacrachtaí a bhíonn ag na mic léinn agus ag an bhfoireann ó thaobh an teagaisc agus ó thaobh na foghlama de. Bíonn! 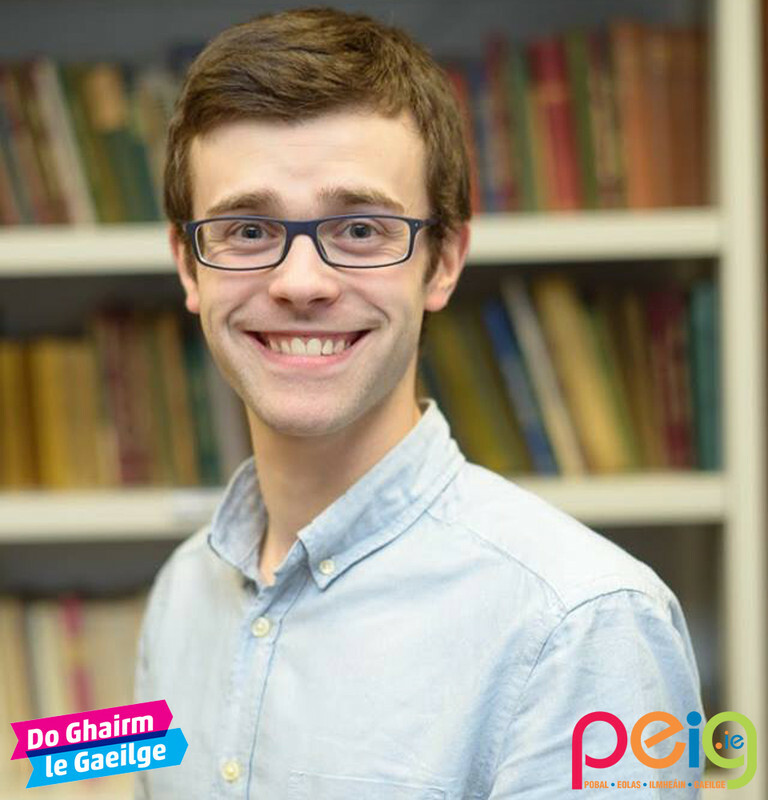 Bím ag labhairt Gaeilge le mo chuid cairde, táim páirteach i gclub leabhar (iontach) Gaeilge agus bím ag freastal ar imeachtaí Gaeilge freisin: REIC, imeachtaí sa Siopa Leabhar, IMRAM, an Pop Up Gaeltacht agus oícheanta breátha i gClub an Chonartha. Is iomaí deis atá ann an Ghaeilge a labhairt ach iad a chuardach! Bím ag tacú leis an bhfoireann acadúil anseo i Scoil na Gaeilge, an Léinn Cheiltigh agus an Bhéaloidis UCD agus iad ag iarraidh leas a bhaint as an teicneolaíocht le cur leis an teagasc. Bím ag cruthú áiseanna foghlama agus measúnaithe ar líne freisin do na mic léinn. Táim i bhfeighil ar Cultúr@UCD, cuntas Soundcloud na Scoile, agus táim ag obair in éineacht le Bairbre Ní Chonchúir, Riarthóir na Nua-Ghaeilge in UCD, ar an tsraith físeán #Gaeilge365, a bhfuil muid ag obair uirthi do Bhliain na Gaeilge. 1. Cuir aithne ar an bpobal agus bain sult as bheith i gcomhluadar daoine eile a labhraíonn Gaeilge. 3. Cuir feabhas ar do chuid gramadaí agus do chuidse cainte. Má bhíonn tú cruinn rachaidh do chuid seansanna san earnáil i méid go mór.